Harwell Godfrey poison ring: dreamy, not deadly. Do you know what a poison ring is, my darlings? They’re one of my very favorite unusual forms of jewelry: a ring with a hidden, hinged compartment that can hold small items like poison. Poison rings are so romantic and mysterious. Most of the poison rings I’ve come across have been antique or vintage, but this modern poison ring by Harwell Godfrey is oh-so-dreamy. It’s inlaid with mother of pearl, white onyx, and lilac enamel with a large and lovely central pearl. That color scheme is so dreamy that I can barely stand it. So delicate and romantic and subtle, with just enough color and texture variation to be as irresistible as it is elegant. The Harwell Godfrey poison ring does not contain poison – it contains solid perfume, a custom Harwell Godfrey blend. A perfume insert is both more useful and less felonious than poison, but I’m sure you could replace it with poison if you really needed a poison ring that could be used for its traditional purpose (I don’t know your life). I haven’t smelled the perfume, but the blend does sound lovely. Here are a few of Harwell Godfrey’s other rings! This designer is very new to me but I’m loving what I’ve seen from her so far. There’s a beautiful inlaid locket that comes with the perfume insert, in case the ring isn’t your cup of tea, and I love the necklaces with this design, too! Especially this custom one. What do you think, darlings? Do you like the poison ring’s gentle color scheme or would you choose one of the other, more vivid Harwell Godfrey rings? I have a weakness for the one on the right above, with the opal, blue enamel, and pink topaz color combo. Stephen Webster poison apple ring. Happy Halloween! As a trick-or-treat bonus post, I am happy to bring you Stephen Webster‘s Poison Apple ring. This is also from his Murder She Wrote collection. The ring is set in rose gold and embellished with rubies and diamonds. 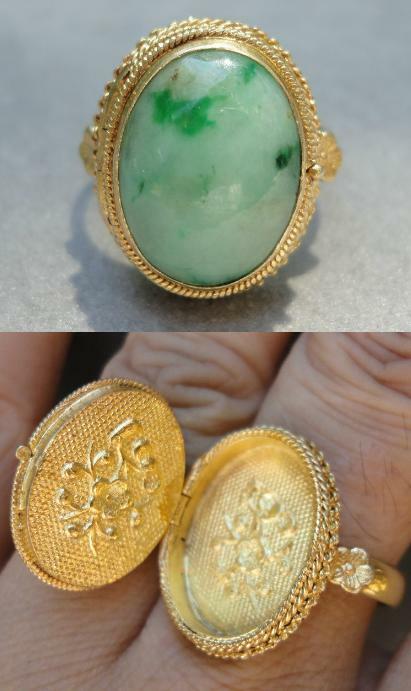 This ring is what’s known as a poison ring or locket ring (“poison ring” is such a cooler name). This means that it conceals a small compartment in which the wearer could conceal a small token or a small amount of poison. One could easily flick open the compartment over an enemy’s glass of wine and let the poison fall gently out. You can see the hinge in the back of the apple below. The ring is the treat, the poison is the trick. If you see a lady wearing this, be polite. All images and info are thanks to The Jewellery Editor and Farfetch.com. Well, work is canceled (yay!) and I have to stay inside because of hurricane Sandy (booo) so I thought I might as well check out what ebay has to offer today. Bonus points if you win any bidding wars before your power goes out! A serious note: please, stay safe, everyone!! Please click here if you’d like check out my guide to buying jewelry on ebay. Without further ado, here is today’s ebay watchlist, featuring KJL, Cathy Waterman, and poison rings. Victorian-inspired 9 karat gold and opal poison ring. Kenneth Jay Lane green hermitage pave cuff bracelet. Estate Cathy Waterman platinum and diamond ring. Victorian-inspired seed pearl and ruby poison ring. Kenneth Jay Lane yellow enamel hinged cuff bracelet. Cathy Waterman platinum, tourmaline, and diamond ring. Vintage Chinese sterling silver and apple green jadeite jade poison ring.